It gives us great pleasure to introduce ourselves as one of the leading fabricator of steel structures, pressure vessels, storage tanks and piping for refineries, chemical companies etc.Â In this highly competitive business, we have never compromised in our Quality Standards. Customer Satisfaction is our first initiative which has attracted many challenging order to us during the last twelve years. Special Steel Industries Co have earned the trust of many companies over the years and has developed an outstanding reputation for dependable and timely deliveries and maintaining very tight construction - all at competitive prices. Our employees are highly skilled and committed to better Quality at reduced prices. Our Factory Premises is located at Amgara Industrial Area. The open area is about 1500Sq. MtrÂ and with all modern facilities and machinery such as a EOT Crane . With the growth of technology and the increasing skills of our workers, we can ensure efficiency in any task that we perform. And we guarantee our products that are second to none. 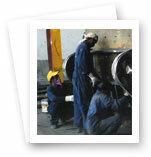 We invite you to explore our Web site and learn why Special Steel Industries Co is The Right Choice for your next job! As you look through this electronic brochure, remember we have a lot of equipment and abilities that are not mentioned here. Please e-mail (or call) us back with your comments.